percentage of trawler yachts are twin engine/twin screw boats. 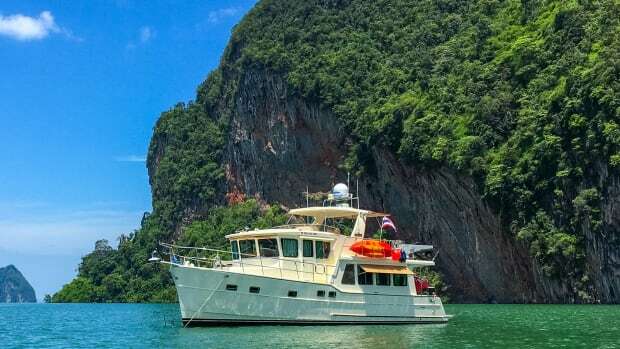 And while many experienced people prefer a single engine for long range cruising, a properly equipped twin screw boat is capable of passagemaking with proper management. An often-asked question is how best to maximize the long distance capability in a vessel with twin engines. When the owners decide it is time to go on a long passage, perhaps even an ocean crossing, they must look for alternative methods of increasing the number of miles they can squeeze out of each gallon of fuel to extend their range. Aside from increasing the fuel capacity of the boat, what can be done to increase range with sufficient reserves for that long passage? There are several options available to long range twin screw owners who want more range-and some of these options have been successfully used to cross oceans. But there is no single strategy for all boats and situations-a lot depends on your hull form and the particulars of your engine room equipment and drive train components. We&apos;ll review these different strategies, and discuss the factors concerning each of them. Remember, each may work for you, but it is up to you to try out the various strategies and determine the best for your own needs, vessel characteristics, and propulsion system. Let&apos;s think of the basics about your hull driving through the water. There are many different powerboat hull forms-ranging from full displacement, rounded bilge, keel boats that can never be driven faster than displacement speed, to hardchined semi-displacement boats that can operate at speeds above the displacement limits, to the fine entry deep-V hulls that efficiently run at higher planing speeds. These hulls are all quite different in their ability to travel through the water, and it is simply impossible to generalize long range procedures that fit all of these boats. In the faster hulls, it would be nice to believe it possible to make a 200- mile passage at a thirty-knot cruising speed to optimize the gallons of fuel per hour consumed, but the weather and sea conditions might become overwhelming factors. Trawlers are most effective when they are doing miles day-after-day at a constant rate of speed-like a turtle. Additionally, beam and waterline length are very important to the equation. A beamy boat often has engines mounted quite far apart, which certainly impacts the ability to run on one engine, especially if the boat has mechanical steering, requiring constant force on the helm, instead of hydraulic steering that automatically holds rudder set. And a long hull will likely track much better than a smaller vessel, so each may require a different approach to maximize range. Running your boat in calm water conditions, eliminating the distraction of wind, waves, and current, you can try different things to determine how to maximize range-at least in calm conditions. Unfortunately, once you go off passagemaking, the actual conditions you&apos;ll encounter will never be quite as optimum, and your horsepower requirements will vary as conditions change. As wave height increases, so does the wetted surface of your boat, requiring more horsepower to drive the boat at the same speed. Each boat is different, taking into account the fuel and water loads, number of crew, and onboard equipment-and conditions are constantly changing, so it is important to try each of the various strategies to really determine the best solution to the long distance question. The point of all this is that there is no secret or magic panacea to the question. 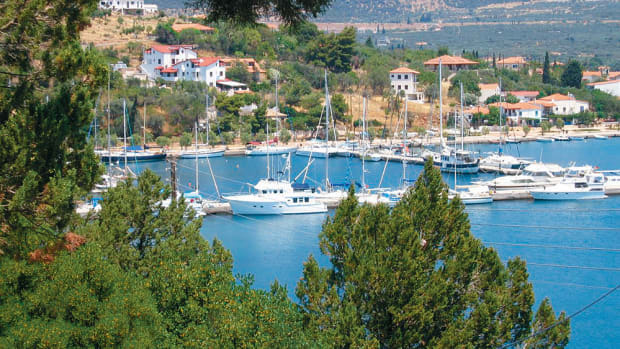 There are things that can be tried on your boat and it is a very worthy goal-especially if you want to expand your cruising territory. goes up, a diesel engine will require more fuel to produce more horsepower. This is usually calculated in number of pounds of fuel per brake horsepower. Liveaboard cruisers sit for long periods at anchor or at the dock, and cleaning the bottom in an annual haulout just doesn&apos;t cut it. Get a diver or have the boat hauled for a quick cleaning. Everything else aside, having a scrupulously clean bottom and drive line is the best way to increase overall range, no matter what hull type and size boat. You probably already know that less fuel is burned when your boat speed drops by even a couple of knots. For example, in a Fleming 55 with standard engines, running at 10 knots burns approximately 9.5 gallons per hour, as measured by fuel monitoring equipment. Slowing the Fleming down to 8 knots reduces the fuel consumption considerably, cutting fuel burn by almost half. And that is with twin engines running. Similarly, a Grand Banks 42 Classic with twin 210 hp diesels uses 14 gallons per hour at 11 knots. Reducing the speed of the GB42 to 9 knots cuts fuel consumption down to 6 gallons per hour. These figures are rough examples, of course, and they don&apos;t take into account the many factors that affect fuel consumption-such as how the boat is loaded, sea conditions, or stabilizing gear. 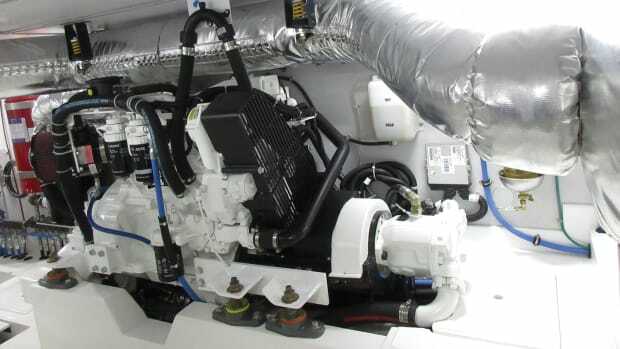 But you can see that running both engines at reduced displacement speeds can be quite economical and even miserly-increasing the overall range of the boat. If you apply this strategy to a fast boat with a long easily-driven hull with a fine entry and two powerful diesels, you might still be running relatively fast-even with the engines almost idling. Such a thoroughbred is meant for speed, and idling the twin engines at a very low rpm is probably not good for long-term operation. Assuming long distance is still the goal, running both engines at slow rpms may not be a good strategy for this kind of boat. 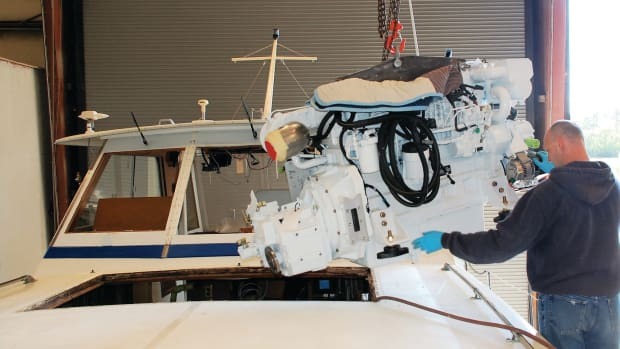 The running gear of the unused engine (propeller, strut, shaft and rudder) are left still in the water, creating a tremendous amount of drag as the running engine moves the boat through the water. Drive line drag increases exponentially as the one engine&apos;s speed increases. Dragging unused drive components through the water becomes a bigger problem if your boat has a broad beam, and the engines are far apart in the hull. Unless you have a sizable keel for keeping the hull on track, the single operating rudder may just not have enough surface area to keep the boat on course-a situation that gets worse at slow speed and/or increasing sea conditions. In some cases there is so much additional drag that the boat can&apos;t go in a straight line without a great deal of rudder deflection-which in turn creates yet additional drag-more wasted horsepower. The largest single source of drag from running one engine comes from the unused propeller- which opens up the age-old argument as to whether a spinning (freewheeling) propeller induces more drag than a propeller that has been locked. How about removing the propeller? This is a rather serious option. Remember, the whole point of this discussion is to find ways to maximize range, not disable the boat. Even on a long distance passage-in some conditions, speed and control are temporarily more important than just maximizing range. If you remove a propeller, you have eliminated the ability to use the second engine. An approaching weather system or a rough channel entrance may make things difficult. Just when you need all possible control-you want to have both engines up and running. Remember, your ability to avoid a broach isn&apos;t helped at all by having off-center propulsion and a small rudder at slow speeds. You could use a drogue to compensate, but why create this situation in the first place? engines and your second engine will be just sitting there-useless. propeller and tools to reinstall the propeller is extremely dangerous in rough conditions. One strategy that offers interesting possibilities is to run just one engine, but allow the second propeller to freewheel as the boat moves through the water. There is some drive line drag, with wear and tear to the drive line, but the second engine is still instantly available. For many years some marine transmission manufacturers for the pleasure boat industry advertised their units were (or were not) safe to be freewheeled. Paragon Gear, for example, promoted their P-Series transmission for freewheeling without harm, while in the 1960s Warner Gear Division was saying "we do not recommend freewheeling of our transmissions under any condition." the gear temperature got over 165°F safe upper limit. This precaution was specifically targeted at large multihull sailboats engaged in ocean crossings, during which they freewheeled for days on end. Some Twin Disc and Caterpillar transmissions are built to freewheel, but you need to check your transmission to see if this is possible with your equipment. One potential problem with this strategy is that as the freewheeling propeller turns, so do the gears in the transmission, generating heat. Since the engine is shut down, there is no cooling circuit available (oil or water) to maintain proper operating temperature- which may overheat the transmission. If the transmission temperature gets too high after freewheeling for hours, it is a simple matter to start the engine-which will circulate the hot oil through the gear and oil cooler while the engine&apos;s water pump provides cooling water to drop the oil temperature. If the single engine is powerful enough to drive the boat at your calculated maximum-range speed, this strategy may be the most viable alternative- giving you the most flexibility in all conditions. You can travel at reduced speed on one engine for most of your voyage, maybe even alternating engines. If conditions require more control or speed than is available from the off-center propulsion, the second engine is instantly brought online. And all things considered, there will be a reduction in fuel consumption running one engine instead of both engines at slow speeds. Please note that if freewheeling is planned, a stop collar, or runaway collar, should be installed on the propeller shaft. This collar should be clamped on the shaft just forward of the packing gland-so that the shaft will be prevented from running away should the coupling set screws or bolts loosen while freewheeling. Many cruising sailors can confirm the need for such a simple device. Think about what&apos;s happening-an engine-driven propeller is constantly pushing forward against the drive line, transmission and engine mounts. When the engine is shut down and the propeller now freewheels, the drag it creates pulls back in the opposite direction as it tries to pull the propeller and shaft right out of the back of the boat. Different stress loads are occurring, and things might loosen. Play it safe-if you freewheel a propeller for long distance cruising, install a stop collar. Another possibility is to run one engine to drive the boat, and run the second engine in gear at slow speed and minimal fuel burn. This gets the second propeller turning to reduce drag (although it may still have more drag than a freewheeling prop as the reduction gears limit the propeller&apos;s rpm). This strategy reduces fuel consumption on the "off engine", and only actual measurement with an accurate fuel flow monitor will let you know if such a procedure significantly increases the overall range on your boat. Idling an engine is not recommended for long periods of time, so you will probably want to switch the driving/idling engines every couple of hours. Check with your engine manufacturer for the best speeds to idle your engines. This strategy still uses more fuel than the freewheeling scenario, but may be a good tactic if freewheeling is not possible with your running gear. from spinning, the reduced frontal blade area is not enough to support flight-and the aircraft falls from the sky! How do you stop the propeller from spinning while running on one engine? This can be done by tying down the shaft, or installing a Vise-Grip chain pliers to the shaft. 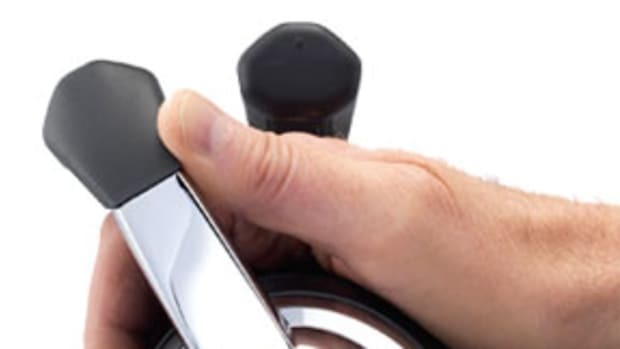 Unfortunately, these devices must be removed before the engine can be started, making things rather dicey in a pinch, when you need full control now. There is another shaft-locking method used on many larger motorsailers which might offer the best strategy to reduce drag. The strategy involves the installation of an automatically-actuated shaftlock on each of the transmissions. This lock is made up of a disc rotor installed between the shaft flanges, with a spring-activated caliper brake that is released by the hydraulic pump pressure of the transmission. Whenever the engine is not running, the shaft is locked. Starting the engine, however, generates transmission oil pressure which releases the brake. If you find that locking the shaft serves you best-using pliers or other temporary measures- perhaps you might consider investing in this equipment. A strategy that comes to us from the sailboat world is the use of feathering propellers. While an expensive alternative, these beauties allow you to use either engine, with the dormant propeller feathering to present a very low profile-creating minimal drag. These propellers require some regular maintenance, and are one more mechanical device on our boat, but they have proven to be very reliable. One brand of feathering propellers, PYI&apos;s MaxProp, also offers the ability to change the pitch of the propeller in 1/2-inch increments by simply making an adjustment to the propeller-right in the water. 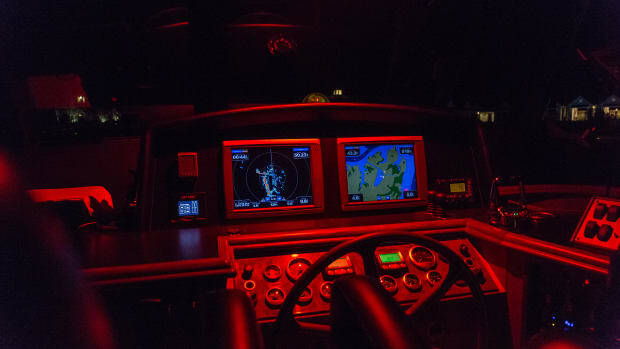 In flat doldrum conditions, for example, someone diving off the boat could adjust the pitch in a matter of seconds, allowing more efficient pitch/engine rpm to match the calm conditions. There is a small efficiency loss due to the symetrically- flat shape of the blades, but it is not significant. And the exposed nature of most twin screw running gear makes any propeller vulnerable to damage-an expensive proposition for a feathering version. They are pricey-in the neighborhood of $3,300 for a 24-inch MaxProp, or $5,500 for their 28-inch three blade. As you can see, there are no magic tricks here- what works on one boat won&apos;t necessarily work on another boat. There are many factors involved and you will have to experiment to find the best strategy for you. Don&apos;t assume what will work for your boat-go out and try it. Some boats have better fuel economy from running both engines at a slower speed than they&apos;ll have running just one engine-a fact proven through measurement and experience. Install a fuel flow meter (again the value of such equipment can&apos;t be overstated) or accurately mark off your sight level gauges on your fuel tanks. Develop a speed and fuel consumption performance curve for your boat, and experiment. Keep your bottom meticulously clean, and try the different strategies in various conditions. You will no doubt find out which strategy works best for your boat. Whether you intend to cross oceans or just go farther on your next cruise, maximizing range is an important capability of the passagemaking concept. Slow down and go farther. You are being environmentally responsible, and you may be able to visit areas that used to be out of reach.